Cultivators Scythe Multi Tool Spares and Spare Parts. 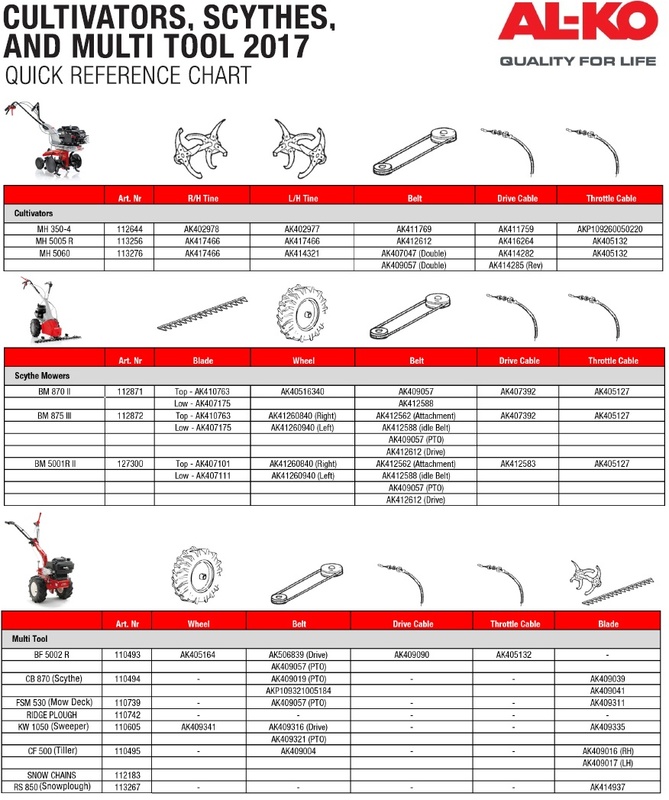 ALKO Cultivators Scythe Multi Tool Spares and Spare parts for ALKO MH350-4, ALKO MH 5005R Spares and Spare Parts, Alko MH5060 Spares and Spare Parts, ALKO BM870 II Spares and Spare Parts, ALKO BM875 III Spares and Spare Parts, ALKO BM5001R II Spares and Spare Parts , ALKO BF5002R Spares and Spare Parts, ALKO CB870 Spares and Spare Parts, ALKO FSM530 Spares and Spare Parts, ALKO RIDGE PLOW Spares and Spare Parts, ALKO KW1050 Spares and Spare Parts, ALKO CF500 Spares and Spare Parts, ALKO SNOW CHAINS Spares and Spare Parts, ALKO RS850 Spares and Spare Parts. Please Scroll Down for Alko Tines Alko Cables Alko Wheels and Alko Cables. Please SELECT the CORRECT Art: NO for your MACHINE, Then Click on the Part Number of the part you require.